°F/°C : Fahrenheit degree and Celsius degree can switch conveniently. 12 hour graphical history of air humidity: Allow you to see humidity in the past or last 12 hours. the humidity alert and mold alert icon would turn red and keep flashing according to the humidity level you set. ★large LCD display and touchscreen- making it easier to read even in a long distance and more smoothly to use than press-key item in current market, no more unmounting the unit to alter settings. ★Daily high and low temperature and humidity records helping you to react ahead of time;the humidity alert and mold alert icon would turn red and keep flashing according to the humidity level you set. 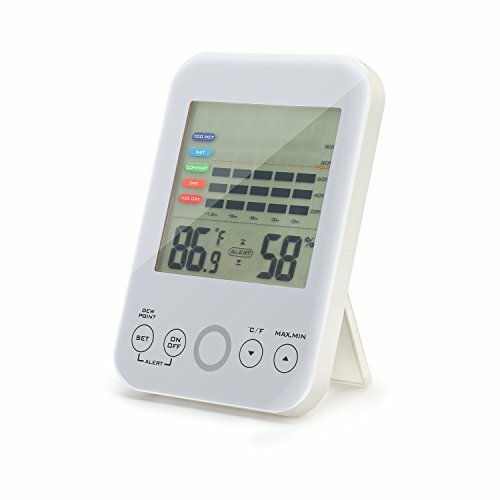 【3 Years Replacement or Refund Warranty】Humidity meter ensures proper humidity control, which has skin, allergen and other health benefits. If you have any questions about this product by Melcan, contact us by completing and submitting the form below. If you are looking for a specif part number, please include it with your message.